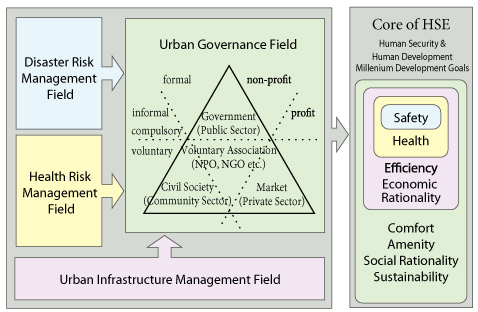 The field of urban governance integrates three research fields: urban infrastructure management, health risk management, and disaster risk management, and seeks a methodology of decision making by which to resolve issues of urban human security through the collaboration of a variety of actors. Urban human security engineering (U-HSE) is intended to achieve not only "reduction in vulnerability (to disaster and health risks)" and "satisfaction of basic human needs," but also "improvement of quality of life," which includes the conservation, regeneration and creation of environment, landscape and culture. To attain these objectives, U-HSE takes advantage of engineering and social sciences in order to resolve a wide range of multi-dimensional urban problems touching on such areas as safety, health, efficiency, economic rationality, comfort, amenity, social rationality, and sustainability. Of prime importance is the need for "multi-layered urban governance" which seeks to solve problems while taking into account the relationships between different environments, such as the natural, sociocultural, artificial, and informational, and which recognizes the multi-scaled nature of those problems, from the architectural/urban to the global. The recent emergence of multifarious actors has been accompanied by changes in the relationships between them. In addition to the government, market and civil sectors, new actors such as NGOs and NPOs have appeared, focusing attention on the solving of problems by taking a bottom-up approach and through collaboration between the various parties. One of the greatest problems to be identified in urban governance is of how to enhance the ability of communities to solve their problems in ways that draw on those communities'distinguishing features. Taking a thoroughgoing field-oriented stance, this field, therefore, places value on the process of regions' spontaneous development, and regionally distinctive good governance. Furthermore, it advocates combining various resource allocation schemes, such as market exchange, redistribution, mutual aid and self-support, and incorporating the voices of the most vulnerable members of the community into decision making. In doing so, it seeks a "methodology of urban governance" by which urban infrastructure and social capital can be built up to facilitate assured environmental, economic and social sustainability, and enhancement of the life quality of individuals. (The Third Sector in the Welfare Triangle) and has been modified.